Bates Nut Farm in Valley Center has been a Pumpkin Patch staple for as long as I can remember (the Bates family has owned the farm since 1921, and I have been going since the early 80s). Bates has plenty of pumpkins of all shapes and sizes, tractor hayrides, a straw maze, pony rides and a petting zoo. Weekends at Bates include live entertainment from 12:00 to 3:00 PM, BBQ, kettle corn, food trucks, rock climb, bounce, slide and other family friendly events. Cost: Free Admission. Pumpkin and activity prices vary. 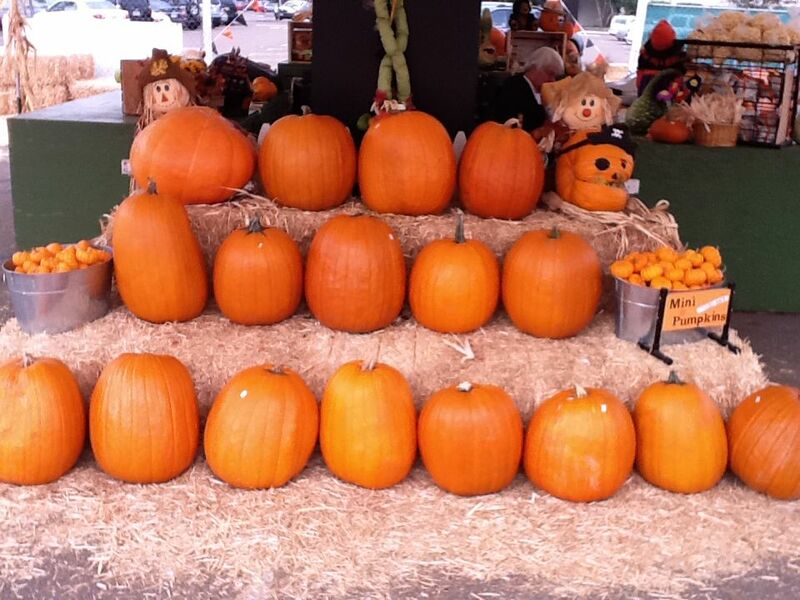 Pick an amazing pumpkin by the beach at Belmont Park’s Boomont Park Fall Festival and Haunt. While you’re there, bravely walk through the Boomont Manor (a kid-friendly haunted house and maze), play zombie laser tag, ride the spooky Giant Dipper and enter the costume contest on Saturdays. Don’t forget to bring the pumpkin pail for free trick-or-treating. Hours: Friday: 5:00 to 10:00 PM. Saturday-Sunday: 11:00 AM to 10:00 PM. Cost: Free admission. Haunted House, rides and laser tag have separate admission costs. Join in the fun aboard the Pumpkin Express at the historic Campo Depot and travel to the Great Pumpkin Patch. 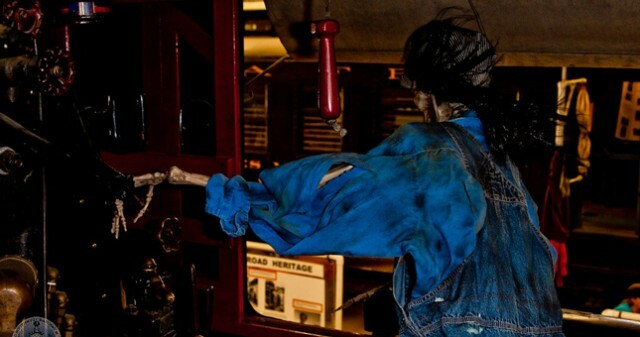 Enjoy the one hour train ride, then tour the Haunted Train, where each child gets to pick out his or her own pumpkin and decorate it inside the Display Building. Advance reservations are required and arrive at least 45 minutes before your departure time. 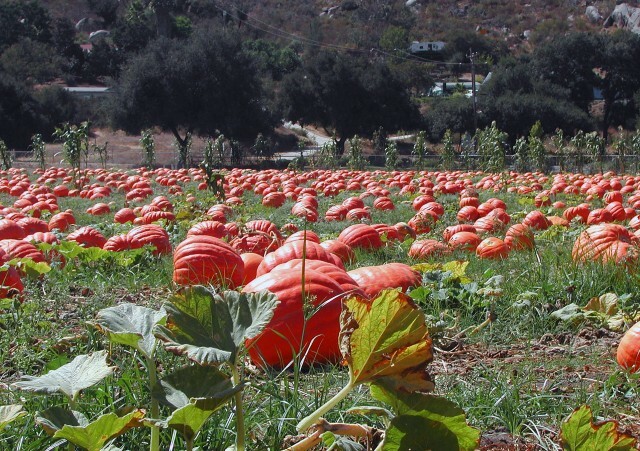 Get a true pumpkin picking experience by picking the perfect future jack-o-lantern straight from Farm Stand West’s pumpkin fields. Stop by over the weekend of October 25-26 between 10:00 AM and 5:00 PM for the Annual Farm Stand Fall Harvest Festival & Boutique. Have fun on a hayride, pick up some delicious homemade jams and farm fresh produce, and shop from local artisans. 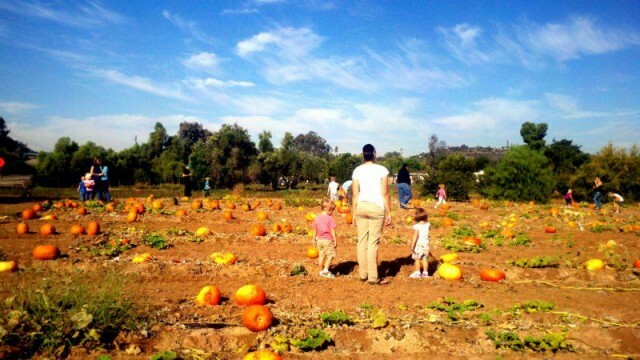 Take the family on a day trip to Julian for apple pie from Mom’s and pumpkins from the Julian Mining Company. Even more fall fun awaits with Indian Camp, Tomahawk throwing and farm animals. Upgrade to the Harvest tour and enjoy a hayride, fresh apple cider and an animal corral. In for a fright? Well then ride on the kid-friendly Night Time Spooky Hayride: Tale of the Doomed Miner through the pastures and fields and includes the tale of the doomed miner (you may even see his spirit wandering with a lantern in the distance). Spooky Hayrides are offered on October 18 and 25 at 7:30 PM and 8:30 PM. Reservations for the Spooky Hayride are required. Hours: Saturday: 10:00 AM to 5:00 PM. Sunday: 12:00 to 5:00 PM. Norris Amusements has North County and South Bay covered with locations in Chula Vista and Oceanside. 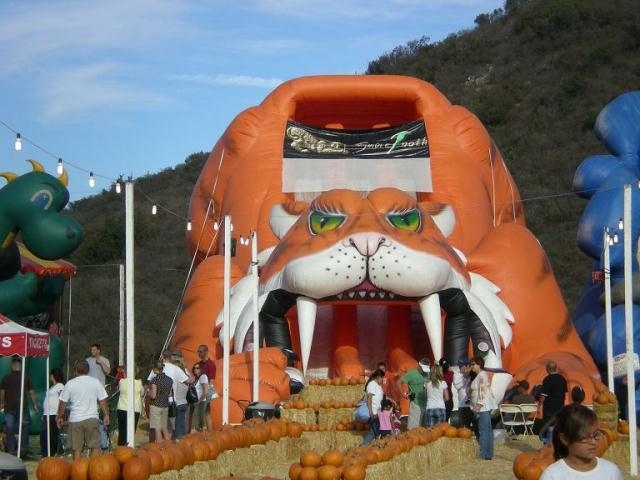 Both locations offers pumpkins and fun for the little ones with bounce houses, giant slides and obstacle courses. Go on Tuesdays for Wristband Tuesday and enjoy unlimited rides for one price. 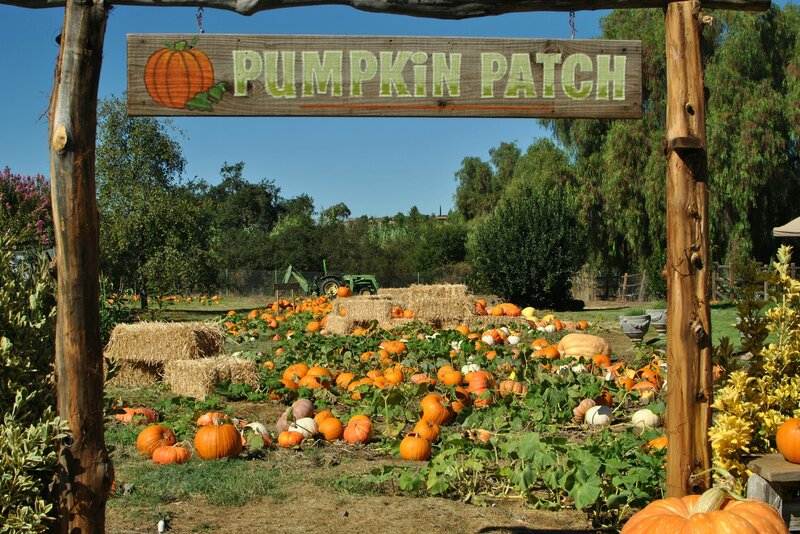 Over in Lakeside, Oma’s Pumpkin Patch is offering fun for the whole family. The child admission includes a Jack Patch pumpkin, a bottle of water, covered hay rides, a hay bale maze, petting corral, kid-powered games, sand pile with toy trucks & tractors, and a large play area with the climbable Cottonseed Mountain. Stop by the San Diego Children’s Discovery Museum for hands-on education (don’t tell the kids), pumpkins and fun. The Fall Family Festival will feature live music by Hullabaloo, a petting zoo, pumpkin patch, food, gardening workshops to educate children and families on current environmental and conservation issues, Halloween costume exchange, and other fun fall activities! 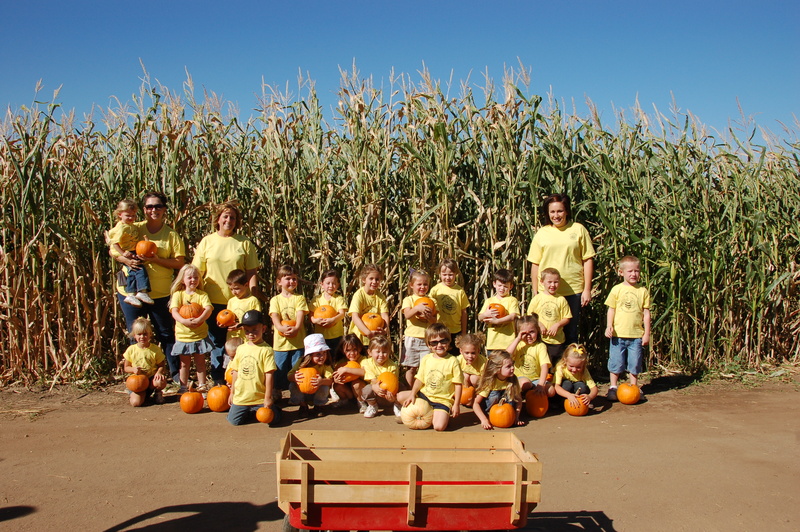 Head on over to Summer Past Farms Pumpkin Patch picking weekends for family fun including a jumpee, popcorn, corn-dogs and smoothies. 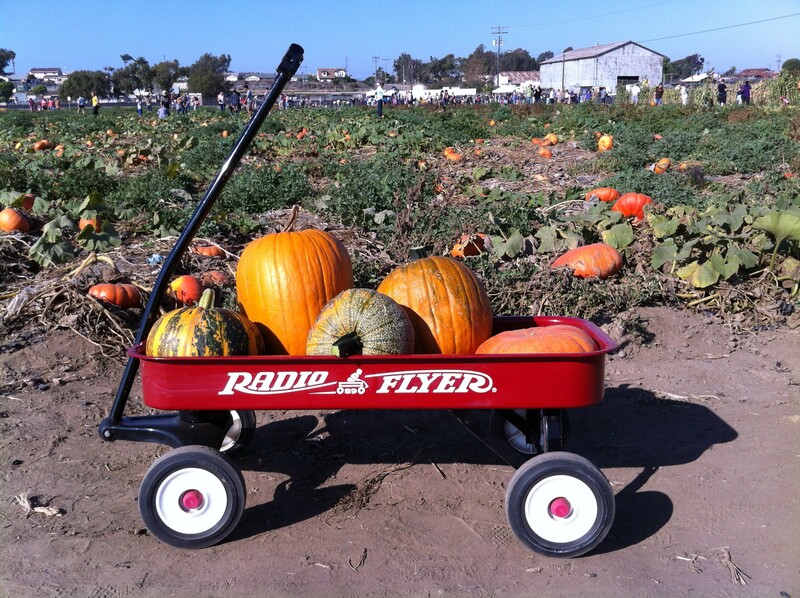 Bring something to help carry home your harvest at Suzie’s Farm Pumpkin Palooza. 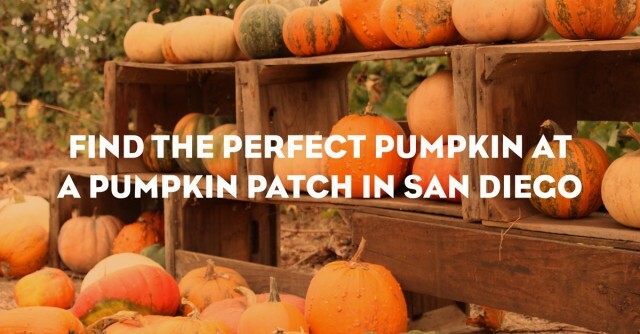 Make a day of it in San Diego’s South Bay with pumpkin picking at Suzie’s Farm. Bring a wheelbarrow to carry home plenty of pumpkins for carving and cooking picked right from the fields, fresh produce, jams and more. 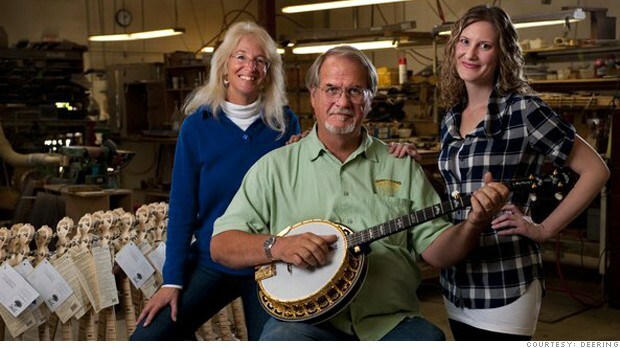 During Pumpkin Palooza, enjoy live music and plenty of delicious food. Don’t forget the camera! Hours: 10:00 AM to 3:00 PM. 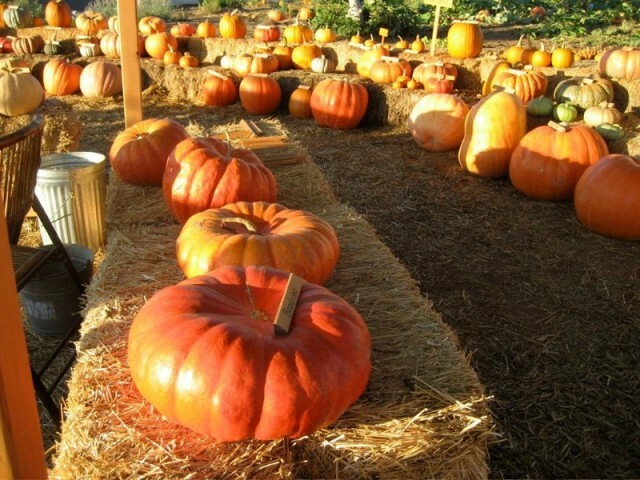 Pumpkin Palooza – 10:00 AM to 4:00 PM. San Diego’s Liberty Station, on the site of Point Loma’s former Naval Training Center, is a thriving, continually reviving, slice of San Diego history – and one of the best ways to explore the neighborhood it is by attending Friday Night Liberty, beginning at 5:00 PM on the first Friday of each month. It’s an opportunity to visit galleries and performance venues for free and meet artists at work in studios that have replaced barracks and classrooms where the U.S. Navy once practiced the art of turning boys into men. 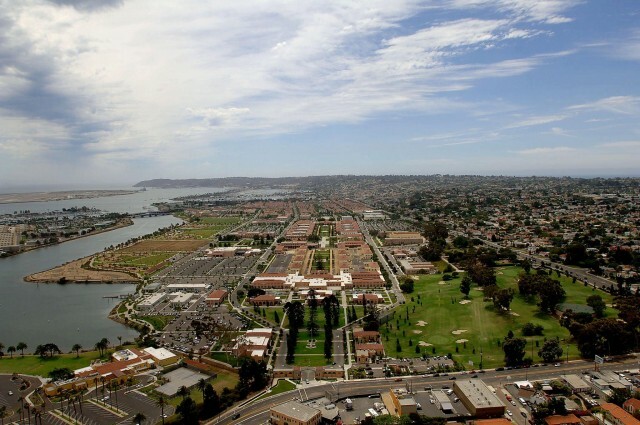 Liberty Station’s roots go back to 1923, when San Diego’s Naval Training Center was dedicated. Over the years, the base produced nearly 2 million sailors – making San Diego the home base for the Navy’s Pacific Fleet. 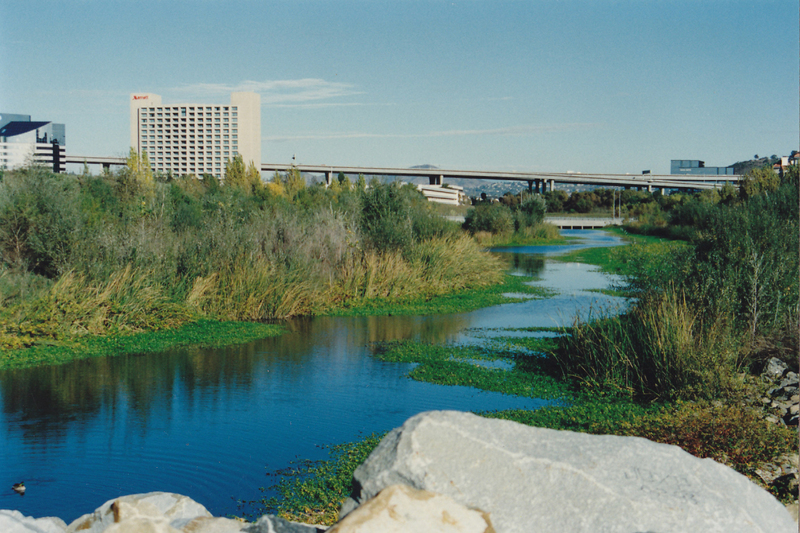 When the Navy closed the base in 1997, a master developer went to work transforming the 361-acre site into a massive mixed-use neighborhood. While the site is listed on the National Register of Historic Places, it remains a work in progress. 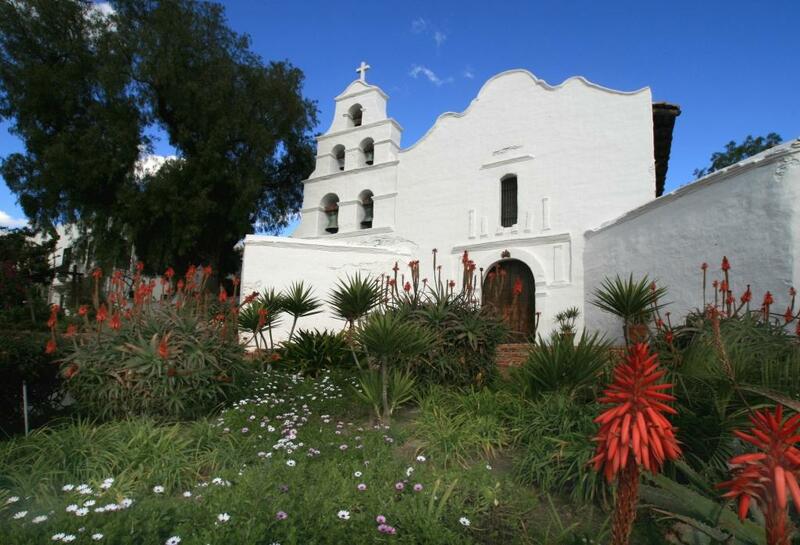 More than 50 of NTC’s original Spanish Colonial Revival buildings have been restored and transformed into performance spaces, artists’ studios, galleries, fitness salons, shops, grocery stores and restaurants. Today, Stone Brewing World Bistro & Gardens serves locally crafted brews and gourmet eats in the space that once was the NTC mess hall. Liberty Station also includes a residential district, office space, schools, churches, two hotels and nearly 50 acres of park/open space along a boat channel that leads to San Diego Bay. The community’s parks have become a popular venue for special events and ethnic festivals. Seasonal kayak and paddleboard rentals are offered. Put Friday Night Liberty at Liberty Station on your calendar. Another great way to experience the neighborhood is with a free audio tour. Stop by the visitor center (the former Command Center) to pick up a map. 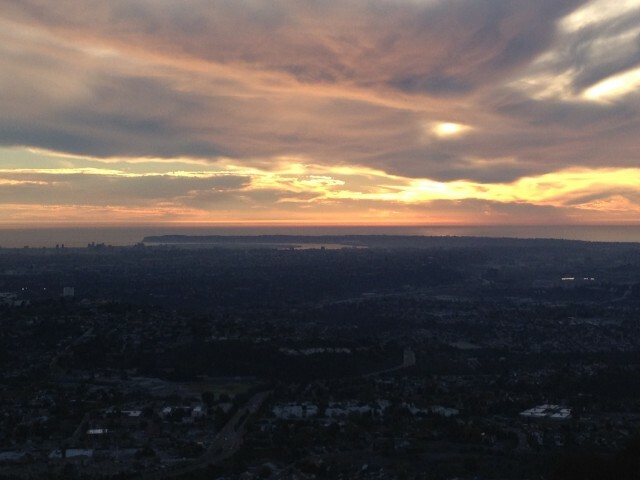 Then call 619.342.8021 on your cell phone, enter a number from the map and hit the # key. There’s plenty of free parking throughout the area. 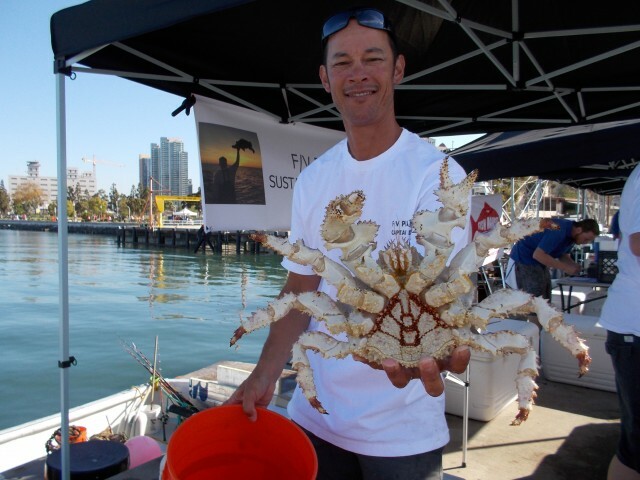 Catch of the Day: Tuna Harbor Dockside Market on San Diego Bay! 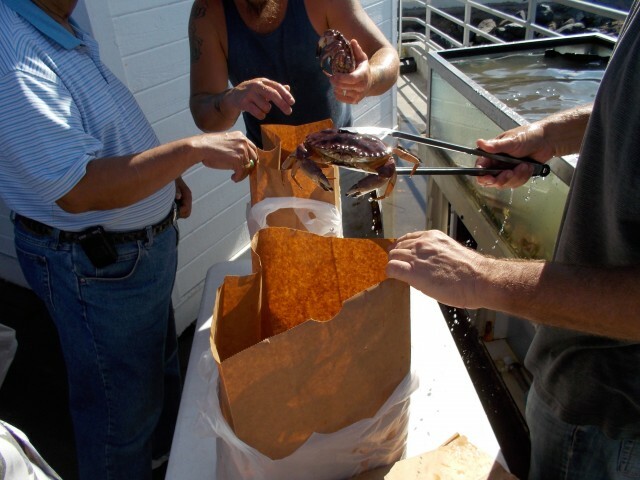 Posing with a big box crab at Tuna Harbor Dockside Market! 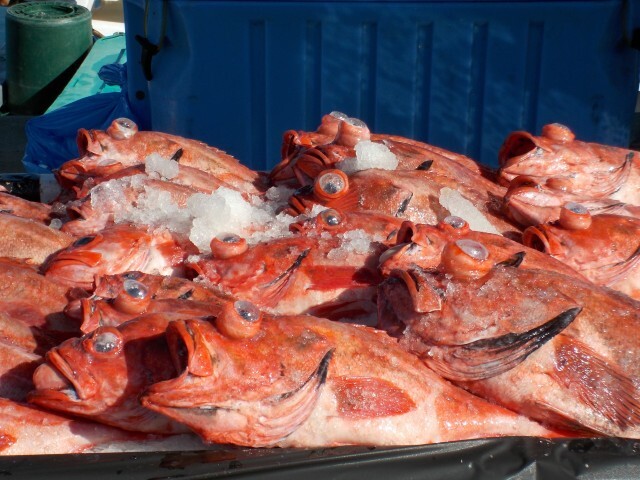 If you”ve ever been to Pike Place Market in Seattle or Fisherman”s Wharf in San Francisco, you know what a delight it is to see seafood as fresh as it gets from local waters. 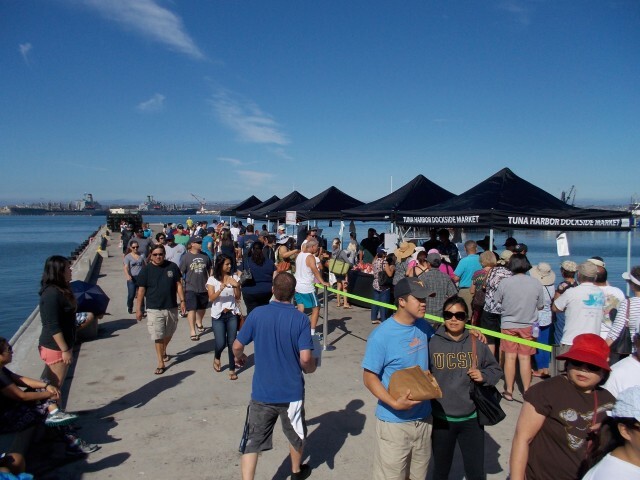 San Diego now has its very own open-air seafood market called the Tuna Harbor Dockside Market, located on Fish Harbor Pier on picturesque San Diego Bay between Seaport Village and Ruocco Park (across the street from the chic new Headquarters at Seaport District). 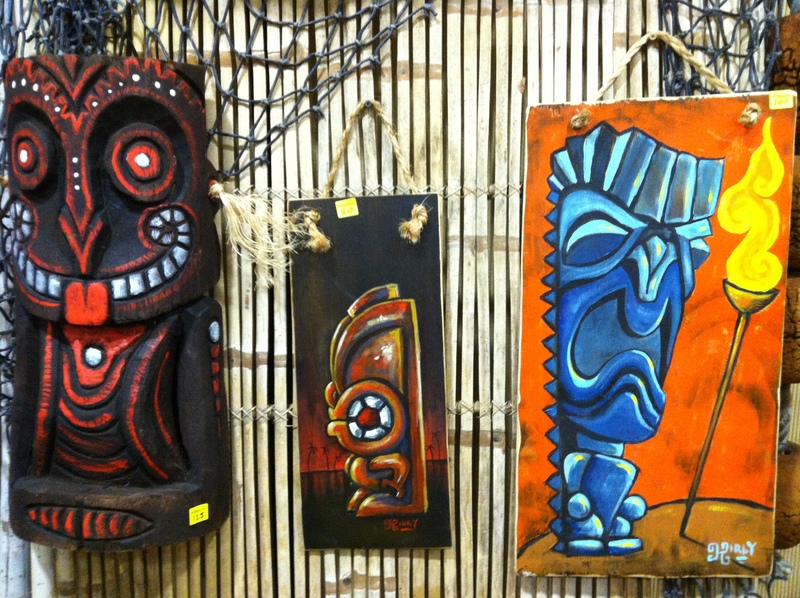 I didn”t know what to expect when I ventured to the market a recent Saturday morning with my camera at the ready. Some fish on ice…perhaps an unusual sea creature or two. But when I saw spiky crabs clawing for attention and a massive 5-foot octopus wriggling for a close-up, I knew I was in for a treat! Hours are from 8:00 AM to 1:00 PM and folks line up early for the best seafood picks online casino to purchase before they”re sold out. I opted to arrive a bit later (around 9:30 AM) and though the line was a few dozen people deep, it moved along at a nice steady pace. For shutterbugs like me, there”s no line to wait in. Just aim your camera between folks as they shuffle by, zoom in on the bountiful sea life and click away! 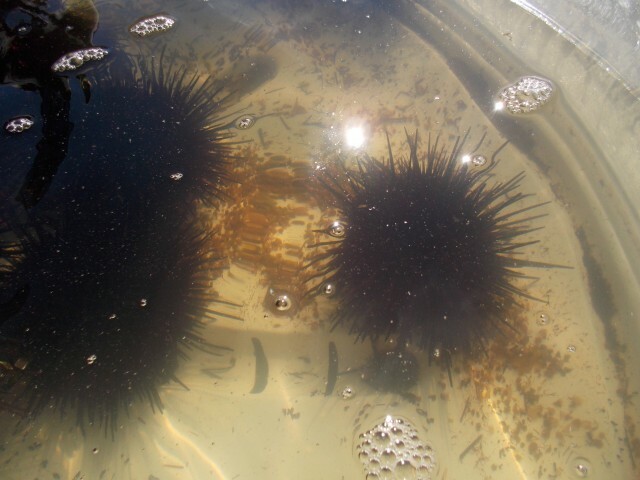 Sea urchin/uni, a local San Diego seafood delicacy! 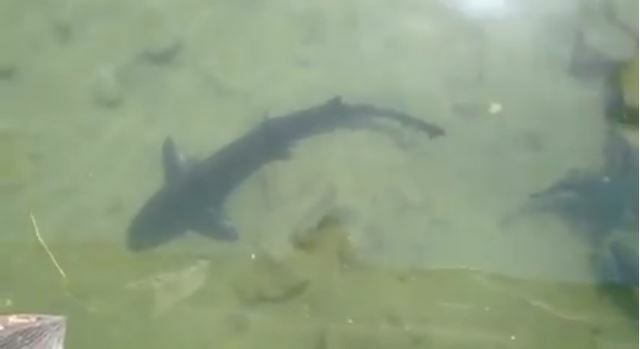 …and my favorite, the feisty box crab; check out this cool video I took! The weekly catch is posted here. The fisherman and women are very friendly and more than happy to pose with their catches and fishing boats anchored in the background! From the newest public water park on the San Diego harbor to favorites at LEGOLAND and Aquatica, visiting San Diego splash zones offers ample opportunity for a soaking good time beyond the beach. Here are some top choices for San Diego non-salt-water adventures. 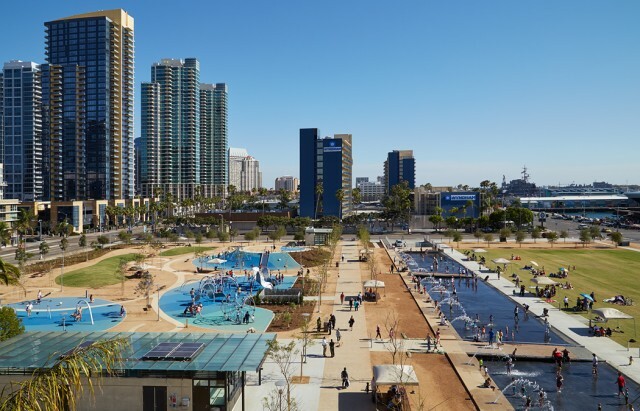 The County of San Diego gave a great gift to locals and visitors alike with a free harborside water park. The park includes large civic greens, children’s play area, intimate garden rooms and expansive interactive fountains that kids and adults are allowed to run around and play in! Yes, you can tell the kids, it’s okay to jump in the fountain! 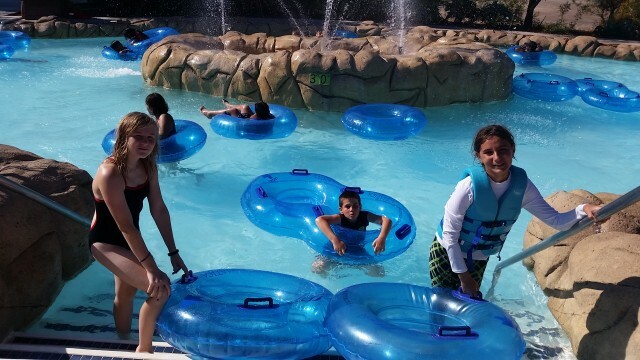 Hop aboard Aquatica’s Loggerhead Lane lazy river, 1,250 feet of easy tubing the whole family can enjoy. This amazing conglomeration of twisty turning slides and long, lazy river rafting rides offers acres of water fun set amid gorgeous live tropical plants, flamingos and turtles. I was pretty wowed by the extensive offerings for every age group, from knee-deep pools with tiny slides for toddlers, to Tassie’s Twister, a waterslide in several parts that I dared only look at. At Aquatica, friends and families can race each other down six-lane slides on Taumata Racers or travel solo in complete darkness through a tube slide on the Kiwi Curl. The park knows how to make a visit enjoyable for guests with plenty of free lounge chairs, cabanas for rent, lockers throughout the park and a new “cashless wristband” connected to your credit card that lets you charge chicken tenders and margaritas without having to access your wallet. LEGOLAND: Now Two Water Parks in One! 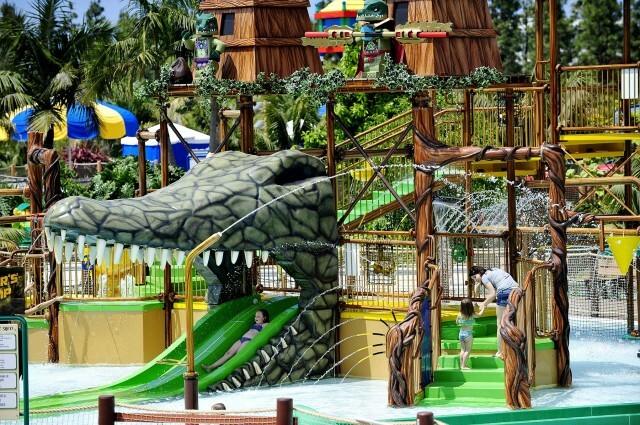 Children enjoy Cragger’s Splash at the new Legends of Chima Water Park. Courtesy LEGOLAND California Resort. My family flipped when LEGOLAND opened its original water park in 2010, turning what was already a favorite theme park into a place with rides and a water park! What could be more fun than building your own LEGO raft and floating down the lazy river after spending a warm day riding roller coasters and propelling self-powered rides at LEGOLAND? There is something for all of us at the LEGOLAND water park, including my little toddler nephews (3 and 5) and my daring 12 year old. We all love the Orange Rush, a giant tube-boat that slips and slides down a wide waterslide way up high while mom shrieks at the top of her lungs (yes, I’m a wimp, but I love a water slide). This spring, LEGOLAND debuted a Chima-themed water park, a connecting water world based on the popular toy line and Cartoon Network’s “Legends of Chima,” featuring more slides for all ages, a large wave pool and over 50 interactive water play opportunities for visitors. Learning to surf the Flow Ride Wave Machine at Belmont Park is just one of the fun activities at Belmont Park in Mission Beach. While I admit that I lack the nerve and coordination to try the two flow wave machines at The Wave House in Belmont Park, I have sat in the centrally located outside, beachy dining area and ordered sushi and watched those braver than I battle the fake sea. I love the setup here: real Pacific Ocean waves rolling in on one side (and the people watching of Mission Beach Boardwalk); on the other side is the amazing skill of the Flow Riders, experts tackling the Flow Barrel‘s consistent and unique waves while they practice surf board tricks. Nearby is the Flow Rider, a beginner friendly wave simulator where you can watch students eat it (a wave, that is) while you dine nearby. San Diego Zoo’s Safari Park has a small area for toddlers called the Savannah Cool Zone near Lion Camp. Small children are allowed to climb on three animal sculpture fountains that spout water. 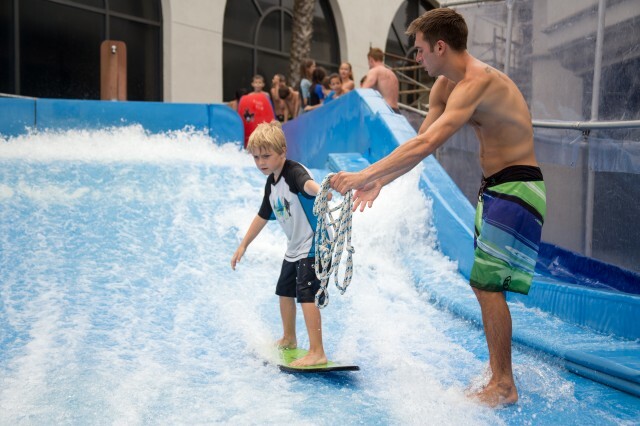 The Wave Waterpark in Vista is a large water park in San Diego’s North County with extensive camps, lessons and slides and more. This spring and summer yielded a bumper crop of adorableness at San Diego’s attractions. Take a gander at the new baby animals and “toddlers” on display – or soon to be on display – at the San Diego Zoo, San Diego Zoo Safari Park and SeaWorld San Diego. 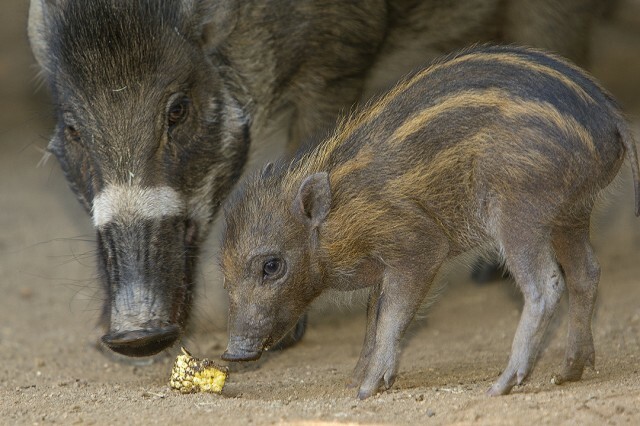 This critically endangered Visayan Warty piglet was born at San Diego Zoo in a successful breeding program that has produced 80 piglets since 2002. Courtesy Tammy Spratt, San Diego Zoo. 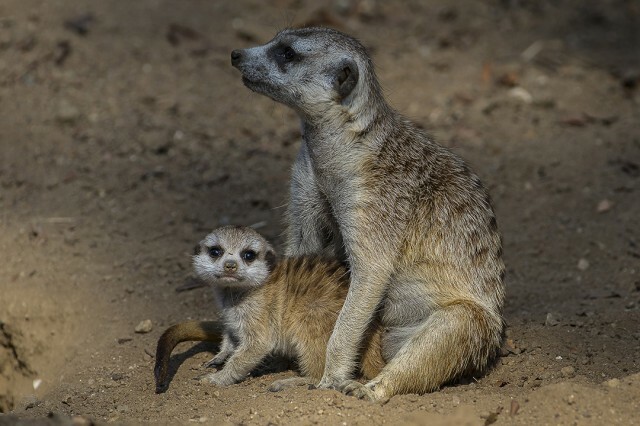 A Southwest African meerkat pup is carefully watched over by its mother. 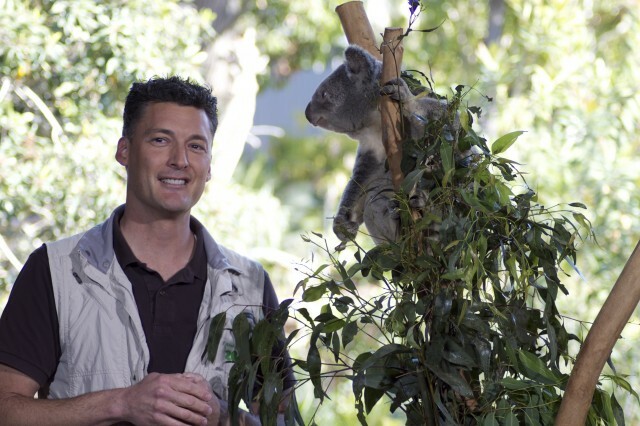 Photo courtesy Ken Bohn at the San Diego Zoo. Such a punim! (Yiddish for “what a cute face”). This meerkat pup was six weeks old when it recently emerged from its burrow, and while it still spends most time below ground, it is beginning learning to forage for food and play above ground with its mother and other members of its mob, or family group. Wolf pup is eager to play courtesy Ken Bohn, San Diego Zoo. 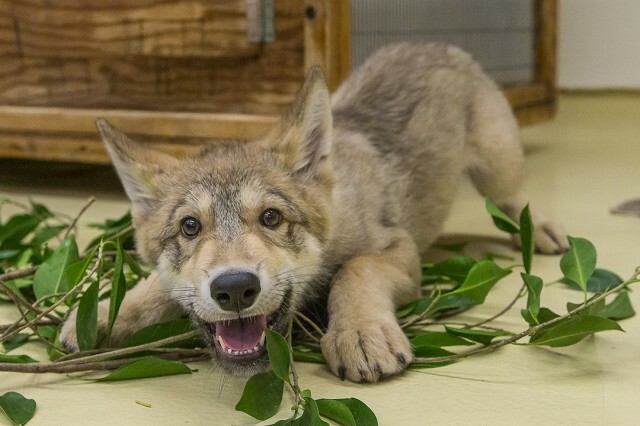 The playful two-month-old 23-pound grey wolf pup pictured here is now three months old and just moved from the Children’s Zoo nursery at the San Diego Zoo. The pup, named Shadow, will live at Wegeforth Bowl and serve as an ambassador for his species. I had the pleasure of peeking at these kitty cuties in the nursery last week. 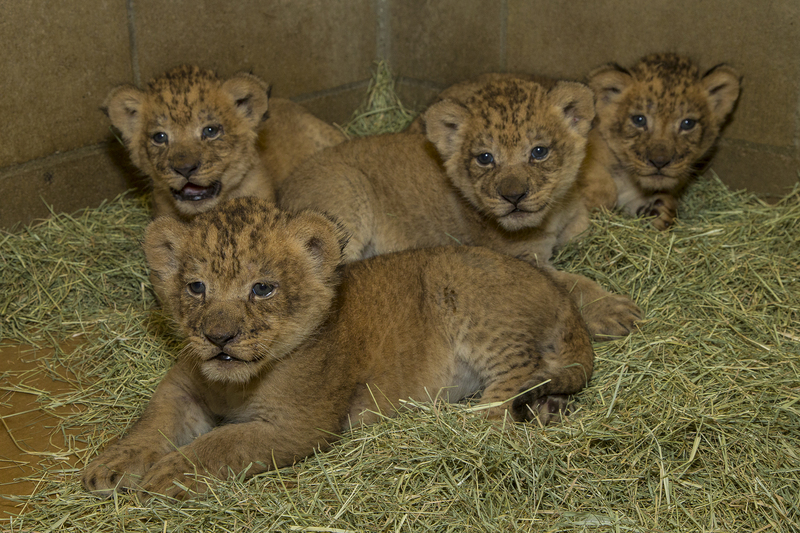 Keepers report lioness mom Oshana is attentive and the cubs appear healthy – nursing, moving and vocalizing well. The cubs will continue to bond with their mother behind the scenes and when they are older and stronger, they will be able to explore a larger habitat and gradually be introduced to their father Izu, and the Safari Park’s other adult female, before going on public view at the Safari Park’s Lion Camp. Baby gorilla at San Diego Zoo Safari Park enjoys the ride. Photo courtesy Ken Bohn. Now five-months old, baby gorilla Joanne has been growing and gaining independence, reaching milestones such as riding on her mother’s back and crawling. Joanne was born at the Safari Park on March 12 after a rare emergency C-section. 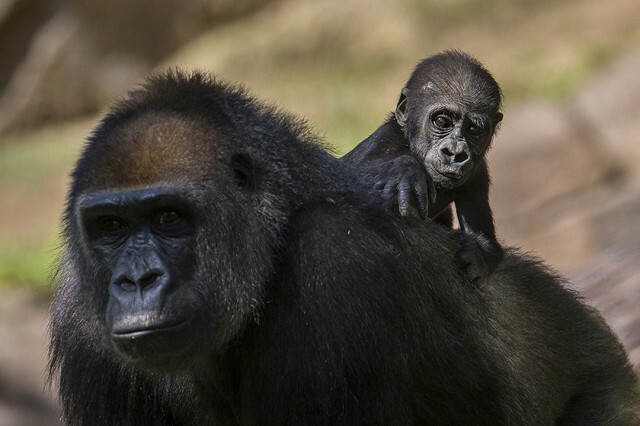 This was the first baby for mother Imani and the 17th gorilla to be born at the Safari Park. 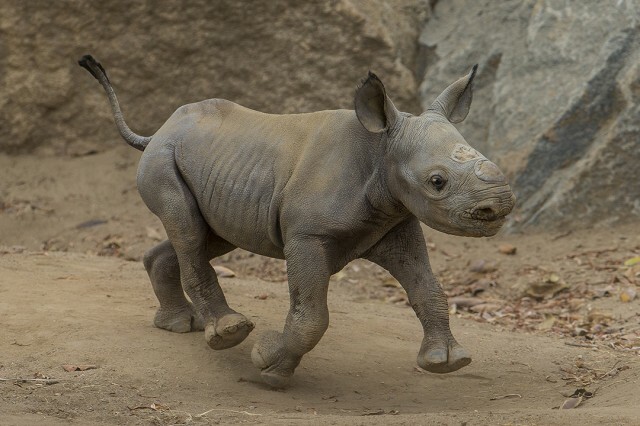 Black rhino baby takes charge at San Diego Zoo Safari Park courtesy Ken Bohn. SeaWorld San Diego is celebrating a successful Caribbean flamingo breeding season in 2014, with 18 chicks hatched so far. SeaWorld’s latest flamboyance of Caribbean flamingo chicks range in age from two weeks old to two months old. The birds are currently being raised by their parents (both mother and father play a role) in the flamingo habitat. The park’s bird keepers are on watch as additional eggs will hatch out in the coming days and weeks. 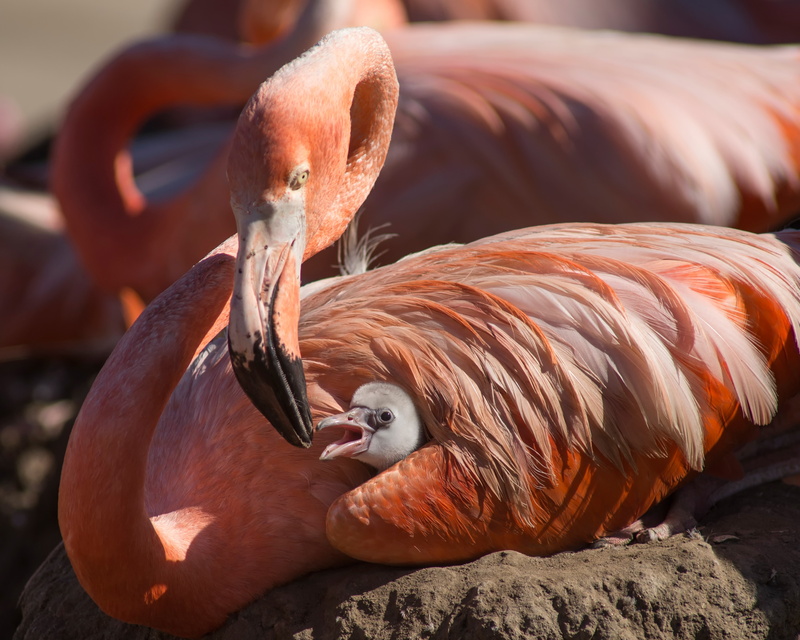 SeaWorld San Diego has been caring for and breeding flamingos since the 1970s. SeaWorld San Diego recently celebrated the hatching of three Magellanic penguin chicks, Courtesy Mike Aguilere/SeaWorld San Diego. 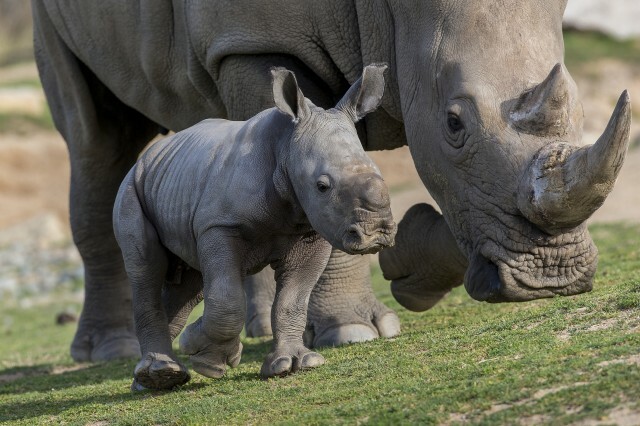 Celebrating the marriage of science and conservation, one of these little guys was conceived through artificial insemination and a frozen sample, perhaps a milestone for preserving endangered species in the future. 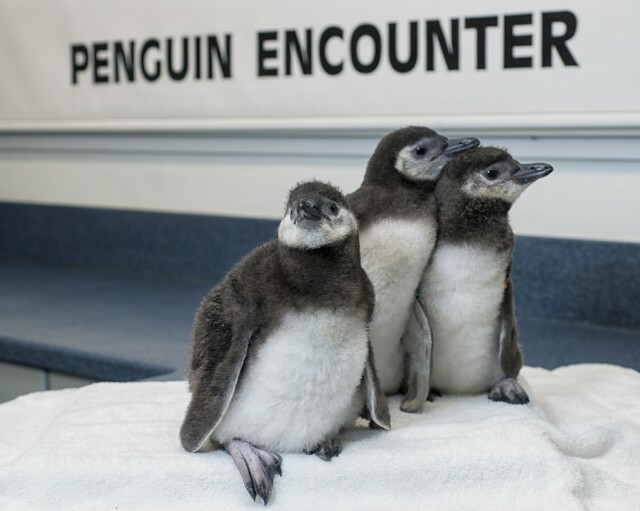 These baby animals just joined the adult colony of Magellanic penguins in an outdoor habitat outside the Penguin Encounter at SeaWorld San Diego. Since 1980, more than 600 penguin chicks have been hatched and raised at the marine park, including the first-ever chinstrap and emperor penguins. SeaWorld aviculturists have had a worldwide impact on pioneering techniques for rearing penguin chicks. 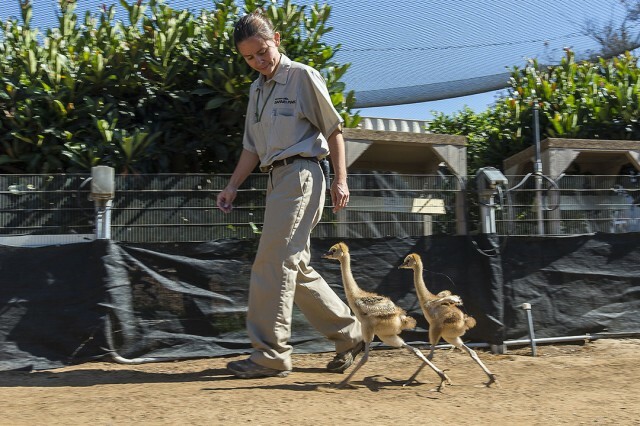 Two East African crowned crane chicks hatched in mid-June at the San Diego Zoo Safari Park get daily exercise to strengthen their feet and long legs and to gain balance before they can join the adult birds in the Safari Park’s African Plains habitat. East African crowned cranes are listed as an endangered species due to the loss, transformation and degradation of their habitat. These two baby animals represent the 62nd and 63rd hatchings of East African crowned cranes at the Safari Park. 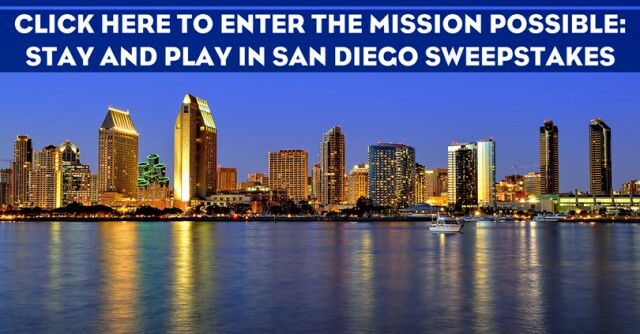 From the beaches to the parks to the friendly vibe of the people, San Diego is truly one of the greatest destinations in the world for children. To top it off, our amazing city has several fun attractions to choose from! 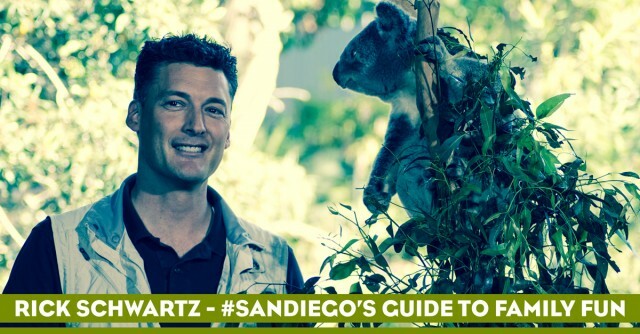 As a local mom of five kids, here are some family friendly tips on how to make the most of three of my favorite places to visit, the San Diego Zoo, San Diego Zoo Safari Park, and LEGOLAND California. Known as the World-Famous Zoo, it truly lives up to the hype as one of the greatest family friendly destinations to see over 4,000 different animals! Trying to see them all in one day might be a tad ambitious, but here are my recommendations that maximize what you can fit in. Start with a walking tour by heading down Center Street, checking out the bears along the way until it turns into Park Street and takes you to the pandas! Head there first as the viewing line for an up close look tends to get long. From there, continue the loop along to the polar bears, a truly fun exhibit where you can view the polar bears playing underwater! As your legs begin to tire, avoid the steep hill and hop on the Skyfari that takes you back toward the entrance of the park. Disembark from your Skyfari bucket and head down Treetops Way to see the orangutan trail, making your way to the Treehouse Café to enjoy the views during lunch. After fueling up, take Monkey Trail back to see gorillas and more, detouring through Scripps Aviary for some spectacular bird viewing. As you make your way back toward the main zoo entrance, catch the Hippo Trail as well. By this point, the whole family will likely need a break, but you haven’t even gotten to the lions, tigers, giraffes and elephants! It’s at this time you can rest your feet on the bus tour catching several more great views of the animals. 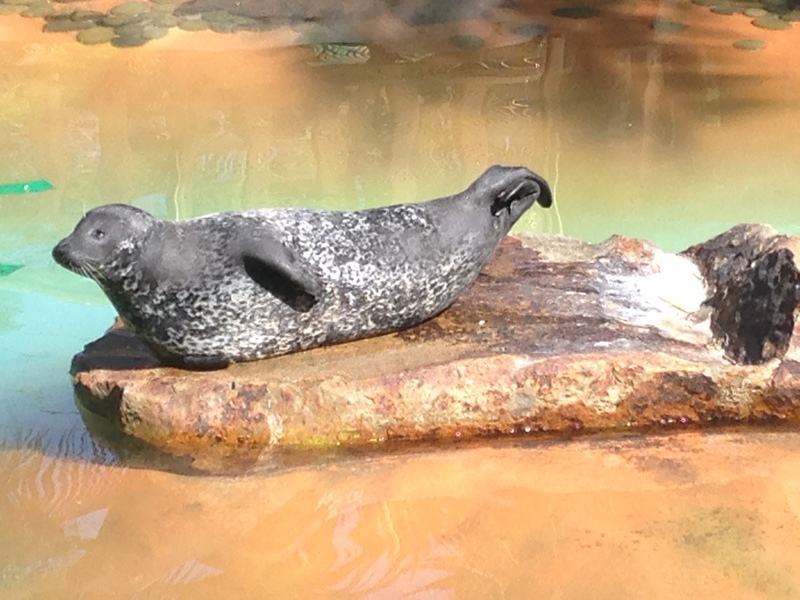 Finally, if there is any ounce of energy left, head to the Children’s Zoo, truly a treat for the younger set. From hands on exhibits to the petting zoo, it’s a delight and the perfect way to end the day. If you have tiny kids that need strollers, the Skyfari does not let strollers on board. 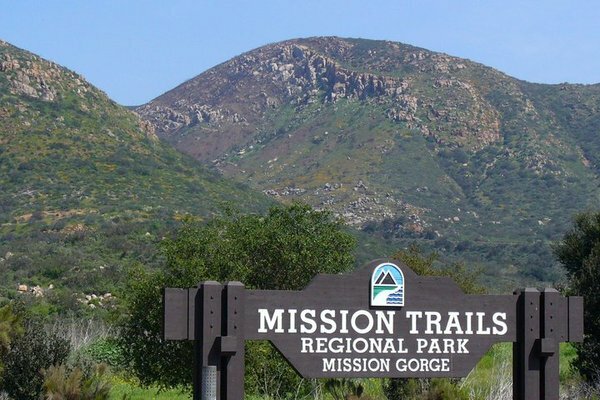 I do recommend parking your stroller and enjoying the sky-high views round trip, then either walking some of the trails or heading straight for the bus tour. The closest you may come to feeling like you actually are in the wild, this park is not to be missed. Note that during spring and summer, temperatures can heat up so head there early to beat the summer heat. Head straight to the African Tram first thing as lines tend to get long later in the day and it is pretty much the only line to worry about. This tram takes your family on a tour of the park and offers a view of the animals in an atmosphere created to be like their natural habitat – a favorite for my kids and me. Once the tour is over, walk over to see the lions since they also tend to draw a crowd, for a can’t miss, up close view! From there, follow the path to see the gorillas, keeping an eye on the various show times. A personal favorite has been the bird show for years and a great way to take a walking break. As lunch time hits, choose the Samburu Terrace and grab one of the tables near the amazing view area! 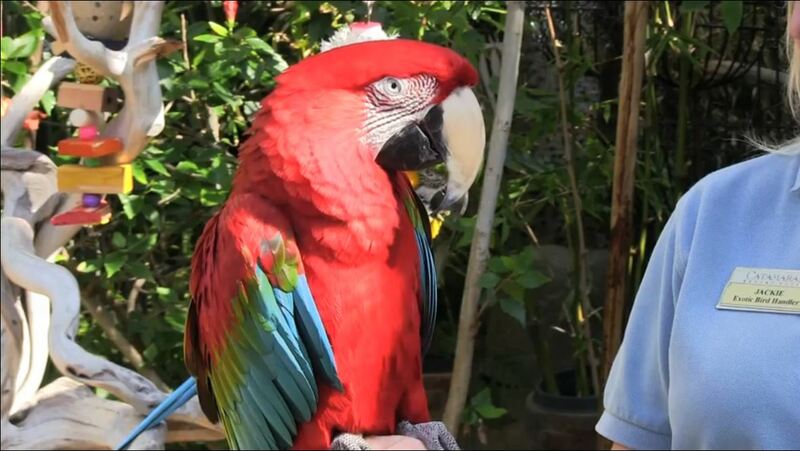 Also, be sure to check the schedule for animal demonstrations for up close views (and even some petting!) of some spectacular creatures. Speaking of which, the petting zoo is always a fun time for the kids as well. Grab your map and seek out the rest of your favorite animals, then cool off in the kid’s fun splash area. Note: bring swimsuits and towels. As the day winds down, hit the carousel near the front entrance. Remember, when traveling with kids, make sure to equip yourself with several snacks to keep hunger away and try to go during times when your child will be least tired. Just as you think you might be headed toward melt down city, let the younger kids sit back and relax in the stroller while you take a walking tour as each of my favorite attractions have plenty of areas to stroll! And when all else fails, remember my mantra: relax while watching one of the shows! For Lego fans young and old, this is must-stop destination while in town. Bring your bricks! If your child has a Lego figurine they are ready to be rid of, they can trade it with any Legoland staff member and continue to keep trading throughout the day! And if you are ready to purchase more, be sure to hit the store early in the day as it can get pretty crowded. Next stop is to head to the back of the park first to avoid the long lines later in the day. Be prepared that the height requirements are very strict for the rides, so be sure to measure your child before waiting in long lines only to be turned away (and I have seen that happen to many a screaming child!). During the warmer months, bring towels and a change of clothes as several rides and the Pirate Shores will get you very wet. Though they have dryers you can pay to use, it’s nice to have a cozy towel handy. When hunger strikes, eat at the restaurants in the aquarium (get your hand stamped for park reentry) and Mini Town as both have delicious food. If you run into a “survey taker” during your visit, be sure to participate as you usually get a cool prize. Once you are ready for a breather, hit the shows. 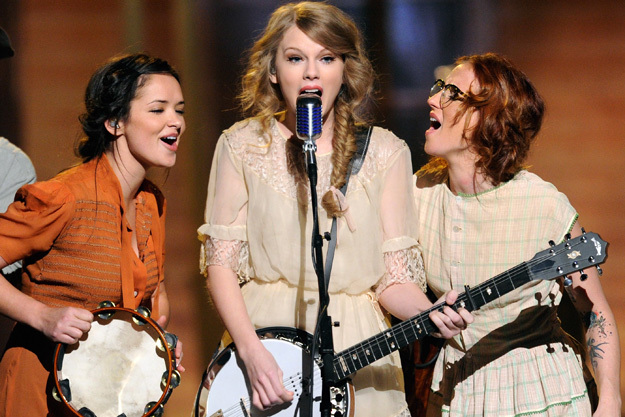 In particular, the “The Big Test,” a.k.a. the fireman show, is a family favorite as are the 3D movies, too. Do you have any family friendly tips to share? Tell us in the comments below!